The feet of mammals have evolved in many different ways from the basic mammalian foot (A), possessed by the earliest shrew-like mammal. Seals (B) have developed evenly graduated toes for a webbed paddle. Moles (C) have truncated toes for leverage when digging. The camel's two toes (D) are padded for walking on sand. Horses have a hoof (E) instead of claws, and elongated feet for speed, as has the cheetah (F). Bats (G) have enormously elongated digits to support wings. Kangaroos' toes (H) are designed for hopping. Lemurs (I) and sloths (J) have forelimbs for grasping trees. 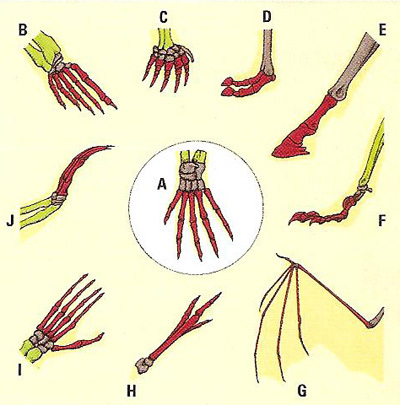 A pentadactyl limb is a limb with five digits (fingers or toes), characteristic of four-legged vertebrates. It is generally used for locomotion and is found in amphibians, reptiles, birds, and mammals, but may be greatly modified (as in the flippers of seals or whales or the wings of bats). It probably evolved from the fins of primitive fish, which are the only modern vertebrates not to retain it.